I thank everyone for their well wishes, thoughts, and prayers over this past week for our dog, Gus. Unfortunately, we made the difficult decision to let him go after seeing his latest test results. As I mentioned last week, he had been eating less and less, and there were several other little differences in his behavior that a trip to the vet was warranted. 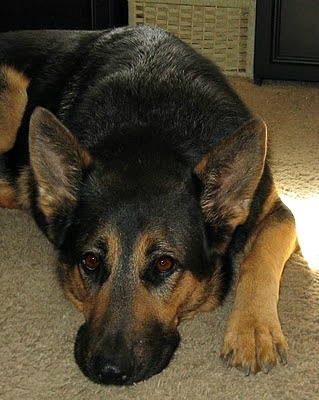 When he came to us on December 7, 2009, we knew that he was heart worm positive. What we didn’t know, was that he was also a victim of of irreversible kidney disease and Ehrlichiosis, a tick-borne disease that can further damage the kidneys. We found all of this out when he was in the staging process for his heart worm treatment, which he never had because his kidneys wouldn’t be able to handle the treatment. Luckily, the x-rays showed that his heart worm wasn’t terribly invasive, so we allowed him to lead a normal life, running and playing, without worrying that his heart would be affected by physical activities. It’s quite possible that his deformed kidneys were there since birth, but we’ll never know. 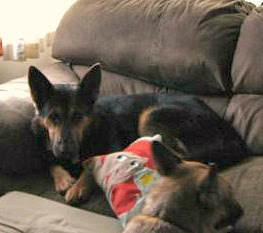 Gus was our third German Shepherd rescue dog, and he came to us from a shelter in DeKalb, Georgia. He was found running loose through the streets, and he was less than two years old. He was underweight at 72 lbs., afraid of every sound, and would cower frequently, leaving me to wonder if he’d been abused. He craved love, and it was obvious that he hadn’t received nearly enough. He adapted easily to our cats and other dogs, and he was a quick learner. He claimed his place as the leader of our pack early on, and was a gentle giant. He had no idea that a dog of his size wasn’t meant to sit on laps. He was the most loving and affectionate dog that we’ve ever had the honor of owning, and the way he would press up against you and nuzzle his face wherever it would fit, could soften even the coldest of hearts. All of our dogs love attention, but after a while, they give you the “enough is enough” look if you snuggle with them for too long. Not this guy though. Looking into his soft brown eyes, you could see that he was just so thankful and happy that someone loved him and cared about him. He was easy to love, even with all of his health problems. Once we started to successfully maintain him both inside and out, he looked and acted like a perfectly healthy dog. And was he ever stunning. We got his weight up to 85 lbs., and he had the most beautiful shiny black hair. In the sunlight, it had a touch of deep purple. He was our first black sable, and though we’re not ready for another one yet, we know that we want another black sable when the time is right. There are so many positive words that I could use to describe him, but if I could only choose one word, it would be sweet. This photo was sent to me by one of the Southern Cross Rescue workers when he was still in Georgia. She told me this was his reaction when he found out that he was coming to live with us. I told you he was sweet! When we took him last Wednesday to see our dear Dr. Hecht, I think he was as shocked and disappointed in his test results as we were. He was amazed that outwardly, Gus looked so good, because the test results showed an entirely different picture. His red and white blood counts were completely off, there was something off in his pancreatic readings, and his kidney numbers were so high, that the machine didn’t read that high to assign a number value to them. The CBC blood panel is a maze of dots, and ideally, everything should be in the center column and be black in color. His did have some reading that way, but it also had many clusters of red (low readings) and clusters of green (high readings) in many of the key areas. His kidneys were gone, and everything else was beginning to fail as well. We took him home, and did everything we could to make him comfortable. Dr. Hecht said we’d know when it was time, and of course my sensible side understood that nothing I could do would change the reality. My unrealistic side kept me hoping against hope, but after a rough Thursday night, we knew that we needed to let him go. Heartbroken and devastated, I made the call. I knew Dr. Hecht was off on Friday, but thankfully his partner was readily available. With truly compassionate care, Dr. Sobaski and his assistant Dee Dee gently and lovingly helped Gus to leave his life with dignity. I stayed with him until the end, letting him know how very much he was loved. This isn’t the first dog we’ve lost, and it won’t be the last. It’s always hard to lose one of our four-legged kids, but man oh man, this one is the hardest ones so far. In 25 years, I’ve never seen my husband so heartbroken. I think what makes the loss of Gus so difficult, is that it all happened so quickly, and that he was only three years old. He’d made such progress in his two short years with us, and while we’re so happy that we had the opportunity to give him a well-deserved good life, we’re just so saddened by the fact that nothing could be done to allow that happiness to last a little longer for him. I know that we were good to him, and I know that we went above and beyond what many other people would have done to keep him healthy as long as we could, so I do find some small comfort in that. We don’t just rescue dogs to give them a better life. We’re selfish, you see, and we also rescue them to enrich our lives as well. So for as much as it may seem that we give to these dogs, each and every one of them has given us so much more. This is a magnet I have on the refrigerator, and it basically says it all. Rest easy, our sweet boy. Oh Mary, I am so sorry. I'm crying right now. What a beautiful tribute to a beautiful Gus. I'm so sorry for your loss, but I am so happy that he was able to have such a loving family. Take care, and thoughts and prayers go out to you and your family. I'm so sorry. Sending love and positive thoughts to you and your family right now. Oh Mary. I am so, so sorry that you had to say goodbye to your friend. Letting a cherished pet go is one of the hardest things. I hope that your great memories, the beautiful pictures (I love that one of him grinning! :D) bring you comfort and make you smile when you think of him. Oh Mary! I'm so sorry for your loss. im so sorry for your loss. At least he's in dogs heaven now. He can run all and play all he wants. I am very sure he's very thankful for having him as part of your family. I'm so sorry for your loss, Mary :( Big hugs to you and your family. Losing a pet is such a hard thing to go through. I'm so sorry Mary. As a mother of fur babies this post touched me deeply. I can feel your pain and know how devastated you and your family must be. Gus was as lucky to have in his life as you were to have him. I'm so sorry; Gus sounds like he was one in a million. You were all so lucky to have each other. I hope that the other four legged kids give you lots of extra snuggles to help you through this. Oh Mary. I was praying for you that Gus would pull through, this absolutely breaks my heart. Sending many hugs and lots of love your way. What a wonderful tribute to a gorgeous guy. This post really brought tears to my eyes. I'm so sorry for your loss, but I am so happy for the time you and your whole family spent with Gus. I can see that he was truly loved and that you guys were his whole world. I'm so sorry to hear about your puppy. :( But it sounds like he had a really great life after you got him, and he was very happy. this is so sad... i love that he wanted to sit on everyone's laps even though he was so big. awww. sweet doggy. I'm so sorry for you loss. He knew he was loved. Oh, I'm so sorry. It's never easy but you did the right thing. You have such a big heart to take rescues in. I know how hard it is to lose a pet. I still feel the pain from losing my baby of 15 years. Its like family. My heart goes out to you and your family. At least he was well loved and you were there for him to the very end. As hard as it is to let them go, its nice to know that they aren't alone in those last moments. I am so sorry for the loss of such a gorgeous baby. I rejoice in every day he had with you. Mary, I couldn't finish reading your post. I'm sorry. I am in tears. I will have to come back and read the rest. 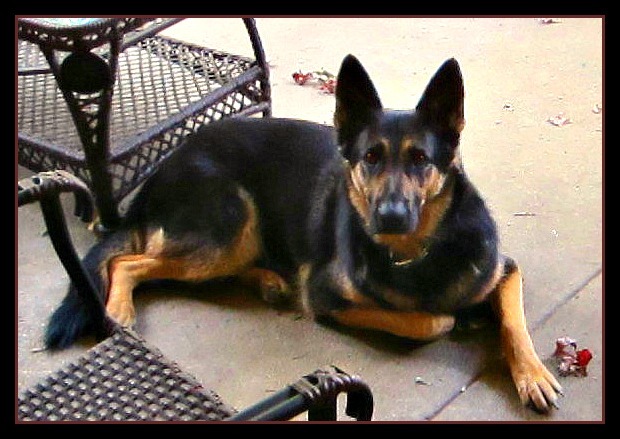 I have had German Shepherds and it struck a nerve. *hugs* I miss my dog. I know how you feel. Bless your heart! I have had many animals come and go throughout my life. It is never easy to say goodbye. 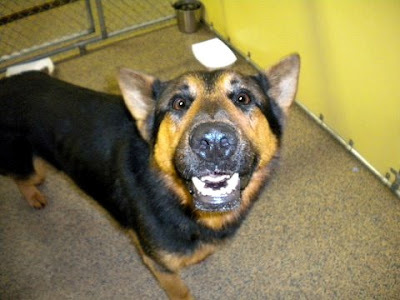 You and your family made the right decision and Gus will remember you when it is time to rescue the next Shepard. Crying as I read this. I usually don't comment, but it was very touching and I send love to you and your family. He was a beautiful boy. I'm so sorry that you had to let him go. He's so gorgeous, and he looks like a sweetheart. I love my adopted cat like a child and I know how heartbreaking it is to have to let a beloved pet go. I'm so glad that he had such a happy, if short, life. I'm so sorry for your loss. I know how hard it is to lose pets. Your post was well-written and moving, and it's clear that Gus was well loved and so lucky to have found your family. I'm so very sorry for your loss - it's hard enough under normal circumstances, but this sort of thing is just devastating. I've been through it a few times myself, and there's just no way to make it easier. Gus looks like a very special, happy and well-loved dog. I'm glad you had the time with him that you did. It speaks to both his strength and your own that he was able to live as well as he did in the time he had. Gus was a beautiful boy! Oh your post made me cry, I'm so sorry :( He was absolutely beautiful. I'm really sorry for your loss. I have been through this a few times as well. It's always hard. But it's great that sweet Gus had 2 great years with you. In the end that's probably the most important thing. Thank you for sharing your story. I'm sure Gus is in a better place now, he left this world knowing that he was immensely loved by you. I'm fortunate enough not to have lost any of my two pets yet, but since the second was rescued from the street, I know how endearing they are, and how heartbreaking it is when you know that whatever you're doing is not enough to heal their past. Obviously Gus had a very happy life with you and you can find comfort in that. Sending you my best supporting thoughts and wishes. tears.... isn't it strange tho, how our furry friends make such an impact on our lives? how, even when another furball comes into our life, we never forget those we have lost? Gus was a gorgeous boy and I am certain he knew how much you loved him. hugs to you. Your tribute to Gus made me teary, how lucky you all were to have found each other. What a beautiful story--I'm so sorry it ended too soon. My heart goes out to you and your DH. I usually avoid posts like these because i always end up crying...letting go of your pet is one of the hardest choices in life....but at least we get to make the choice for them. I wish you strength and love...and hope happy memories will warm your heart with joy. I'm so sorry for your loss. He was a beautiful dog and I'm glad you were able to give him a good home. Oh man, I cried. It's so unfair that he had to have all that happen to him in his short life. But at least most of his life was spent with an obviously loving family who did everything they could to make his life better. I ma so sorry for the loss of your beloved boy Gus. I am sitting here crying as I know just how much you and your family must be hurting. Untill you have Pets, I dont think anyone ever really understands the bond and that pure love. I have 3 gorgeous pups, and my eldest nearly 4 Harry, has his problems, and I know that one day I am going to have to make that same heart wrenching decision. Gus was so lucky to of found you as you were him. RIP Gus. He was gorgeous, I'm glad you gave him such a loved life. I am so sorry for your loss. Reading this made me cry. He was such a gorgeous boy. He is no longer suffering and is in a better place. I'm so sorry about your sweet Gus. Oh, I am so sorry, honey. I know from experience that this is the hardest decision to make, but it really is the most selfless one. Just know that everything you did for Gus was beautiful and selfless. You gave that poor, unloved puppy a home full of warmth, love, and probably spoiled him rotten, because that's what animals like him deserve. And you let him go peacefully and knowing that he was loved. I'm so sorry for your loss! You brought tears to my eyes. I know Gus is in a better place now. I have three dogs and your post was very hard to read. I am glad I did because Gus seems like a wonderful dog who was blessed with loving owners. I am sorry for your loss. I'm sorry for your lose. Your post brought me to tears. I am a huge dog lover as well. But he had a great loving family during his life and that's what matter. He was a beautiful dog. I'm so sad for your loss (actually I'm crying right now). I always read about Gus on your blog & was so hoping his lie would have been longer than 3 years. Having lost several pets myself, I can imagine how hard it must be for you - I wish all the best! I'm so sorry for your loss. Your sweet story brought me to tears. I could tell that you loved Gus very much, and he was probably so grateful to feel your love in just the short time you knew him. He was lucky to be with you and you were lucky to know him. I'm so sorry for your loss. Your love for him is obvious by your writing, it made me tear up, and that rarely happens. Oh my gosh, that post made me tear up. I'm not generally an emotional person but just something about animals turns me into a mess. I'm so sorry for your loss, he sounded like such an amazing creature. You were lucky to have each other. Even if it was only for a short while, I'm sure you made his life infinitely better. Although his medical condition couldn't be helped, I hope you realised that you helped him to live out the rest of his life happy. Like everyone else, I'm crying for your poor sweet Gus. Mary, my thoughts are with you and your family. I'm extremely sorry for your loss. So many people are extremely inconsiderate of pets, and disregard them as nothing but animals, when they're in fact our companions, our best friends. All I can say is, you were lucky to have him, and he was lucky to have you. You both seem to have loved each other very, very much. Letting him go, wasn't giving up on him, it was giving him the right to not live a tortured life until the last minute ! My cat died last year, July 24th, a date forever etched in my head. I know what it feels like to lose a best friend, the most amazing one at that. Mary, I'm so sorry. Gus really blessed your lives & he blessed your families. I know he's waiting in Heaven for all of you. Your a wonderful woman for rescuing dogs. I know your all in a lot of pain right now. Just remember all the love he gave your family. (((hugs))). I am so very sorry for you loss. *Tender hugs*. That magnet says it exactly. 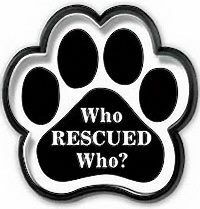 All of our rescues (2 dogs, 2 cats) have enriched my life in so many ways. Willow, our only remaining furbaby, came to us exactly 1 week after our 14yo Max passed. 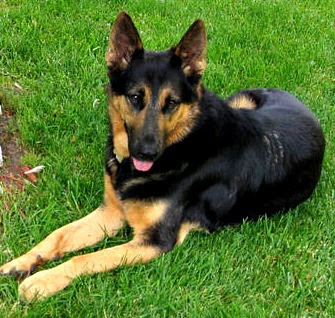 I firmly believe that Max sent her to us, because that was the kind of dog he was. Know that Gus will always be watching over you. Nothing touches your life like the love of a good dog. So sorry for your loss but so thankful he had you! Best wishes. Sorry to hear about Gus :( at least he's on longer suffering. He was lucky to be rescued by loving people like you. So it's a good thing. Even though he didn't live a long life, I'm sure his life was awesome thanks to you. May he rest in peace. *hugs* You gave him a wonderful, wonderful life. Reading your post made me cry this morning, I'm sorry for your loss! So sorry to hear about Gus. It's so sad when they are so young when they leave us. Just want to thank you for making his time on this earth a happy one. Hope he found my Poohbear and is romping and playing with her now. I'm so sorry. You where truly blessed to had him. 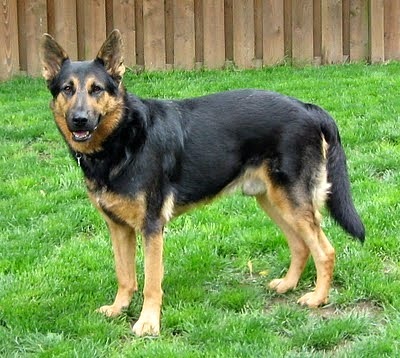 I grew up with a female German shepherd and boy do they know how to grab your heart. I'm so sorry you had to make this difficult choice. Been there, know how hard it is. But it's a choice made with the heart and for them, for the love we have for them. Big hugs to you. SOOO sorry to hear it, but I am so happy you had the time you did with them. I am still heartbroken over my equally affectionate kitty I had to put down in 2010 and the rest of my cat household has been in chaos because of it. Apparently she was the linchpin that held it all together, and now things are just not right. My thoughts and prayers go out to you and yours who loved him so. My heart goes out to you and Gus. I rescued an older golden retriever in 2010; she is 9-10 years old now. I am not looking forward to the day when I will need to let her go too. Rest in peace, Gus! God bless you and Gus. I believe that dogs are truly gifts from God. They're so much more than companions, more than members of the family, more than four-legged children...if you've never had your own pup, you just don't understand. God bless you for rescuing Gus (of course he rescued you too!). I wish more people would adopt a pound puppy and save a life. As a very young child, I was an "animal magnate"; I loved them all, but cats were my favorite, by far. One day, when I was 10, my mother brought home a 12-week-old puppy, and from then on, my heart has belonged to DOGS. She was smooth and black, with velvety, floppy ears and a "waterfall"of white down her chest; she kind of looked like a black lab puppy with the body type of a doxie.. A few weeks later, she "bloomed": she grew a fluffy, silvery-copper beard, furry tufts at her chest and feet, but her ears stayed velvety-black. She looked like a cairn terrier, crossed with a mini schnauzer, crossed with a yorkie, crossed with a Norwich; she had a long body with tiny short legs. She seemed to just *know* what to do without being trained. We did "train" her, but it was kind of like we said "here's what to do, Corky", and she would just do it. I think she may have been a human being in a past life, honestly. She was SOOOOO smart, adorable, cuddly, playful...One day (in my teenage years) I was depressed about something; I laid down on the family room carpet, stretched out on my stomach, face down, silent. Corky comes sidling up right next to me , ears in the "altert", upright position, a look of concern (honestly!) on her adorable face. ; she stretched out next to me, in the exact same position. Back then, in the '80s, my sisters used to sunbathe in the backyard. Later on in the day after we came in, we'd see Corky laying out, "sunbathing" on the patio on her back, EXACT same position! She did that a lot! Then she'd give us this look, as if to say "What? I'm trying to get some color!". We always had a cat, too; they were "Corky's cat" ( if another cat came in the yard, though, she'd go after it.) They'd sleep in the same basket, play and wrestle (her signature move was to back into the cat's claws, rear first, looking over her shoulder all the while.) She was very healthy, until her later years; she developed cancer when she was about 17-18 years old. To say that she won my heart would be a gross understatement. She made me a fanatical dog lover. She blessed our family with 18 years of complete, unconditional love and fun, and we were blessed to be able to give it back to her. May God be with you and your family, Mary. There are many people out here praying for you and your family. I truly believe he'll be there waiting for you when it's your time. Yikes! I'm sorry my post was so huge. Bye, Gus-Gus, you big beautiful sweetie. ((big hugs)) to you and your whole family, Mary. I am in tears having just read that. What a beautiful tribute to a dog who was so clearly loved. I'm so very sorry for your and your family's loss, Mary. I think somehow dogs understand and are so grateful when they're rescued. It's heartbreaking that Gus was so young, but I know he was overjoyed to be a part of your family for two years, receiving love and tenderness in abundance. My heart goes out to you, your husband and the rest of your (furry and not so furry) family and friends. You opened your heart and home so that he could have a better life, and I know he did. I'm a new follower of your blog... and I got to this post and bawled my eyes out. He was so loved by you. I'm so glad that he had a chance to know real love... I've lost several dogs of my own.. love to you and yours! I am so sorry to hear about your baby. He had such a pretty smile! You are in my thoughts. mary, that was so touching. thanks for sharing Gus with us. You all were blessed to have such a family! RIP Gus!